High petroleum prices and increasing concerns over energy security and climate change are driving the development of renewable biofuels in recent years [1, 2]. Bioethanol has been commercially used as a gasoline replacement in major markets of the world. However, this early generation of biofuel has several problems, such as low energy density and high hygroscopicity, leading to storage and transportation problems . Recent development in microbial engineering has enabled the bioproduction of a suite of biofuel molecules, such as 1-butanol, isobutanol, limonene, hydrogenated farnesene, and fatty acid-derived alkanes, alkenes, alcohols, and esters [4–11]. Based on the chain length or the number of carbon atoms in their molecules, biofuels can be divided into short-chain (C4-C8), medium-chain (C9-C14), and long-chain (C15–C20) fuels. Based on their chain structures, biofuels can be divided into straight-chain or branched-chain biofuels. Compared to straight-chain biofuels, their branched-chain counterparts often have better physical and combustion properties. Branched short-chain alcohols such as isobutanol and 3-methyl-1-butanol have higher octane values than their linear-chain counterparts [3, 12]. Branched long-chain fuels offer improved properties such as lower freezing point, better cold flow, and lower cloud point, compared with their straight-chain counterparts [13, 14], which are vital to practical biofuel use at low temperature and high altitude, particularly for jet fuels. While production of straight-chain biofuels has been extensively reviewed [15, 16], this review targets recent progress in the microbial synthesis and overproduction of branched biofuels and their immediate precursors. Current branched fuels mostly contain only methyl branches. Ethyl and higher branched structures are relatively rare in nature and have not been extensively engineered for energy applications. Branched short-chain alcohols and esters, such as isopentenol, isobutanol, 2-methyl-1-butanol, and 3-methyl-1-butanol, are mostly derived from branched α-keto acids. Branched long-chain fuels are mostly derived from lipid fatty acids. These two types of biofuels are the major focus of this review. Branched medium-chain biofuels can be derived by engineering the isoprenoid pathway, which has been excellently reviewed elsewhere [16, 17] thus will not be discussed here. 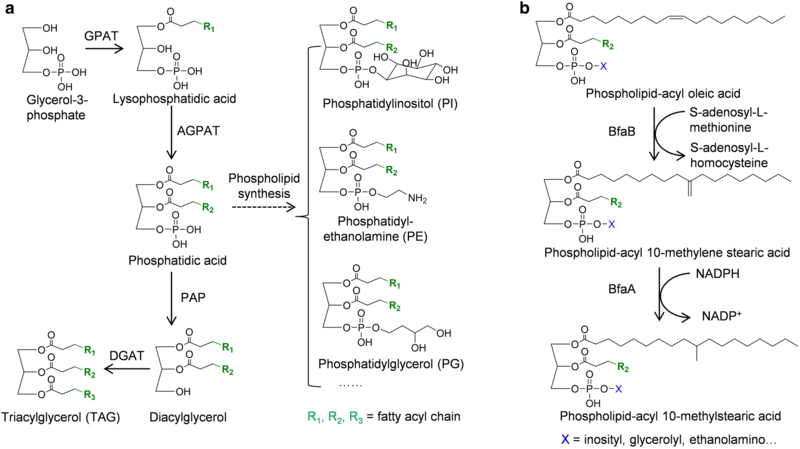 Medium-chain biofuels can also be biosynthesized by truncating the intermediates during lipid fatty acid biosynthesis [18, 19], which will be discussed together with short- and long-chain fuels. Among the branched long-chain fuels, the position of the branch can be either at the terminus or the middle of the chain. These two types of compounds were synthesized by different routes of the lipid metabolic pathway and thus are discussed separately. For each pathway, we briefly discuss the natural function of the branched compounds that lead to the synthesis of biofuels, followed by an introduction of the pathway, its regulation, and recent engineering efforts in the overproduction of branched biofuels. General metabolic engineering strategies to improve titers, yields, and productivities have been reviewed elsewhere and will not be discussed [20–23]. Many of the advanced biofuels are in their early developmental stage; therefore, their scalable production and real-world application will not be the focus of this review. The biosynthetic pathway of terminally branched LCFAs in B. subtilis is well characterized [47–49] as shown in Fig. 2. This pathway used branched-chain α-keto acids as the precursors , which are first activated to short-chain acyl-CoAs by branched-chain α-keto acid dehydrogenases (BKD, encoded by the bkd operon). C4 and C5 branched-chain acyl-CoAs are the primer for the biosynthesis of terminally branched LCFAs, and malonyl-CoA is the chain extender of the primer. β-ketoacyl-acyl carrier protein synthase III (FabH) catalyzes the first condensation step by condensing branched-chain acyl-CoAs with malonyl-acyl carrier protein (malonyl-ACP). 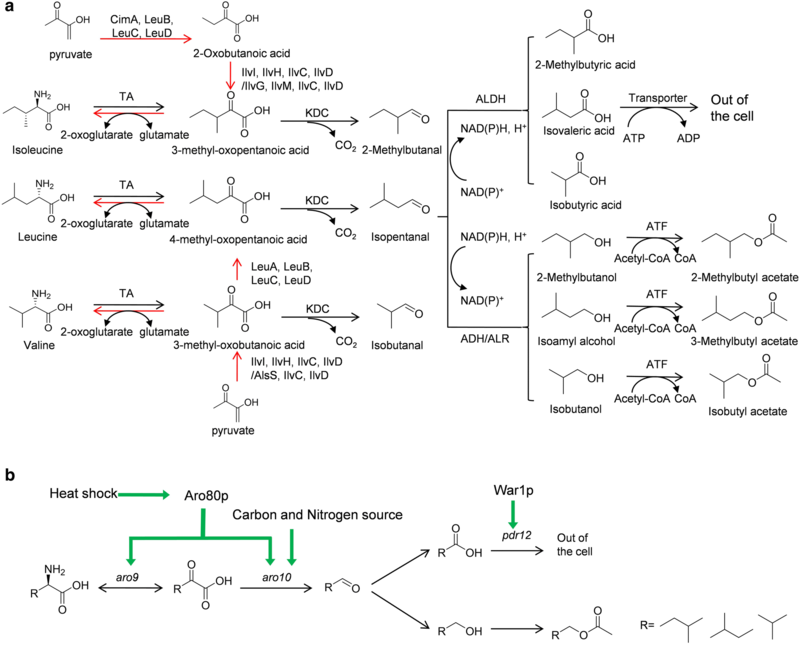 The resulting β-ketoacyl-ACP is then elongated through repeated cycles of reactions catalyzed by the multienzyme fatty acid type II biosynthesis system (FASII) to yield terminally branched long-chain acyl-ACPs. Thioesterase can hydrolyze long-chain acyl-ACPs to produce free terminally branched LCFAs. Depending on the α-keto acid precursor, different terminally branched LCFA species can be formed . For example, 3-methyl-oxobutyric acid can be converted to isobutyryl-CoA, which yields even-numbered iso-C14:0 and iso-C16:0 fatty acids. Precursors 4-methyl-oxopentanoic acid and 3-methyl-oxopentanoic acid will yield odd-numbered iso-branched and anteiso-branched C15:0 and C17:0 fatty acids, respectively .